As a professional mechanical internal combustion forklift truck manufacturer in China, we can provide many kinds of mechanical forklift trucks. The available models are CPC15, CPC20, CPC25, CPC30, and CPC40. 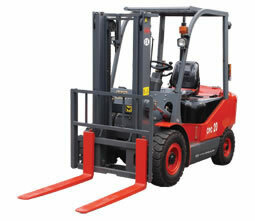 These mechanical forklifts are designed with high quality diesel engine. Their load center is 500mm and lift height is 3000mm. When they are loaded, their maximum gradeability is 20%. For more parameters about our mechanical internal combustion forklift truck, please refer to the parameter table. Our mechanical internal combustion forklift truck is equipped with digital intelligent driving control system, so the operation data of forklift can be obtained and the whole process control can be achieved. Its full hydraulic steering system can help ease the fatigue of operator. The steering system is designed with crank sliding piece steering structure, so the reliable steering can be guaranteed. The construction equipment uses classical ASF YTO space frame structure. It is ergonomically designed, aesthetic in appearance, compact in structure, and easy to operate. Our mechanical internal combustion forklift truck adopts optimized gantry rail section design and the enlarged internal width enables the driver to enjoy a wide scope of eyesight. With more than 50 years of experience, we can produce not only mechanical internal combustion forklift truck and other construction machinery, but also combine harvester, crawler tractor, plow, wheeled tractor and other agricultural machinery. We have obtained ISO9001:2008 and ISO14001 certifications, so you can feel secure in using our products.